« Estava ao Norte! – I was North! 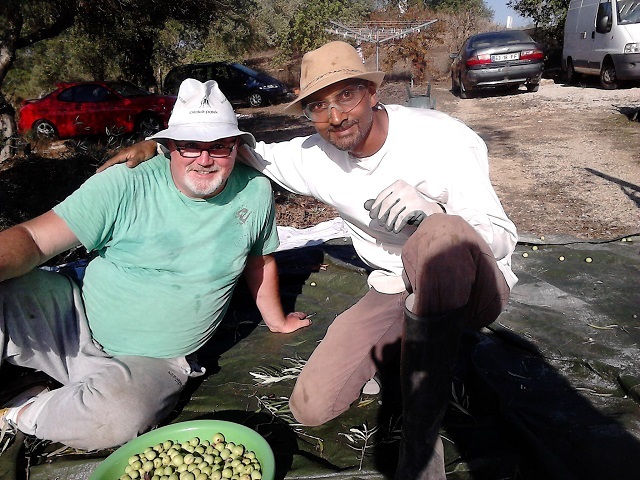 Middle of October was amateur olive picking season commenced in the eastern algarve mid October. This was linked to the Co-operative press in Santa Catarina do Fonte da Bispo starting up. No money ideally exchanges hands. 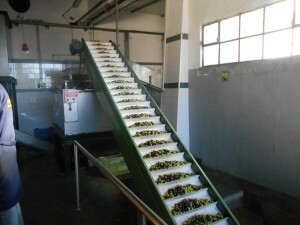 People collect their olives and take them in for pressing to extract the oil. The co-operative keeps a percentage of the oil. 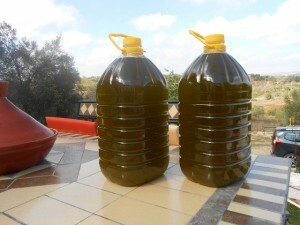 I have yet to confirm this, but I believe you get about 1 litre of olive oil for every 10 kg of olives pressed. The first pressing of a batch of olives gives you the coveted virgin olive oil. If you want to get the this virgin oil from your own batch of olives you need to make an appointment to take them in and you need to have a minimum quantity. I believe this to be 400 kg. 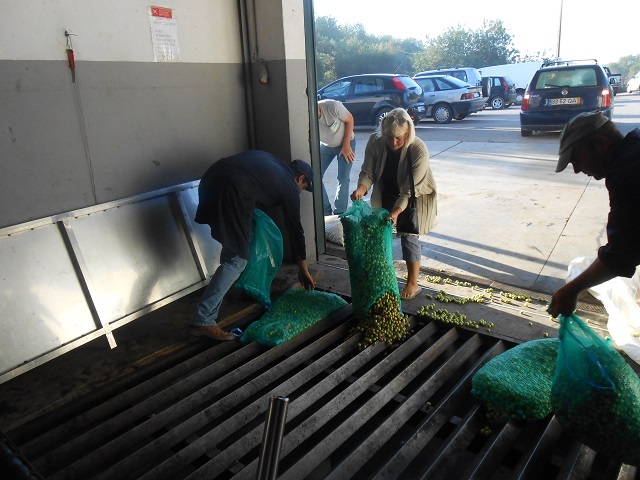 The batch I combined my small harvest of 41 kg exceed one tonne. 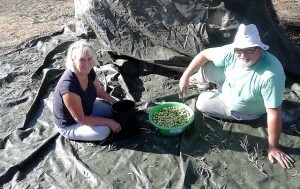 This was a combined harvesting effort of seven to eight people, including my two neighbours with whom I harvested olives. For the purpose of oil extraction the size or variety does not seem to be critical. Having said this, if a batch has too many very raw green olives it will be rejected. This is because of raw olives adversely affecting the pH value of the oil finally produced. I have recently found out that there is place in Tavira which buys harvests of eating quality olives for 75 cents a kilogram. These would have to be harvested carefully, preferable by hand to avoid damaging them. I may explore this option next year. Harvesting olives for pressing is hard word. You lay mats, tarpaulin sheet or nets around the base of the trees and then use suitable implements to knock off the olives. Implements we used included cane poles, garden rakes and some plastic rakes from the Chinese shop. The latter proved to be ineffective. 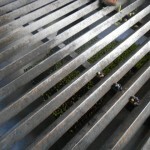 Olives that a lower down can be stripped of the branches directly into a bucket. Luckily the weather was on our side and those two days though tiring were fun as the it was sunny enough and not too hot. My neighbour kept the troops well fed and watered as we worked harvesting the trees on her plot. All in all, it was a great experience. 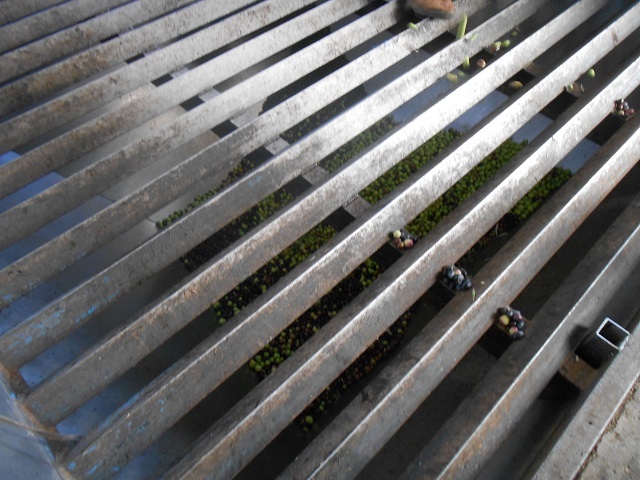 This entry was posted on Sunday, October 18th, 2015 and is filed under Sustainable Living. You can follow any responses to this entry through RSS 2.0. Responses are currently closed, but you can trackback from your own site.